If we understand art mediation as “a strategy to build up a bridge between a specific work of art and its audiences”, therefore enhancing the opportunity to facilitate understanding of a particular artwork, it is not difficult to conclude that every specific work of art needs to be analysed and treated with a specific mediation strategy. This does not mean that there aren’t common “good practises” but that its implementation should not be executed as if they were mathematical formulas. In other words, the way in which we implement an art mediation strategy (the how) will alter its potential results. It is for those reasons that we understand art mediation practises as an approach, a holistic one, which should take every detail from conception to production, presentation and management as a key factor that can structure the mediated experience of audiences in front of a given artwork. From the methodological point of view, it is necessary to note that the arguments here presented are conclusions drawn from practical experience. Let us explain this in more detail, as we discover ELMUR.NET project, an artistic audio-visual project that we will use as case of study to clarify the reasons behind the exposed thesis. 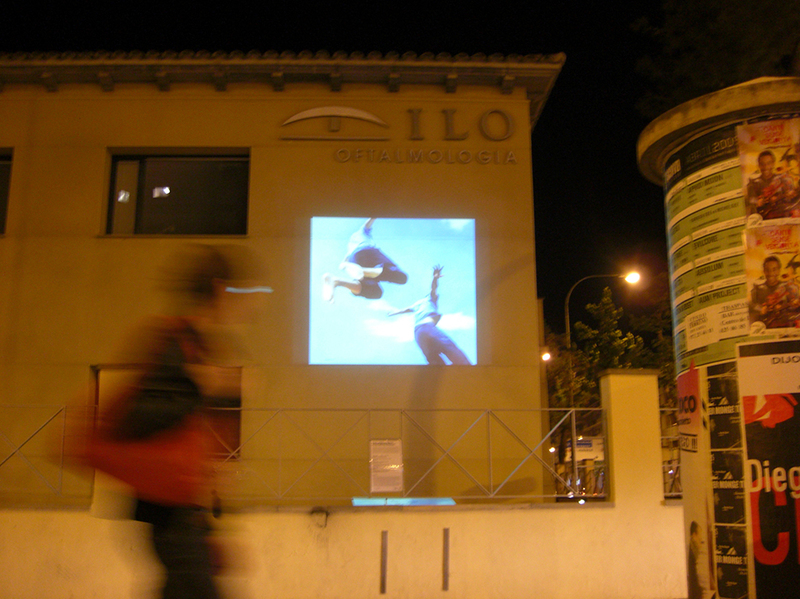 ELMUR.NET is a permanent video art installation located in a public space in Lleida, Spain. By means of a web platform it collects creative videos from worldwide citizens, videos that talk about positive ideas, thoughts, captured moments, etc. Any kind of moving images those help us to re-consider our daily reality from a creative perspective. Which facts or specific characteristics of ELMUR.NET contribute to structure the mediated experience that facilitates access to audiences towards its particular artistic proposal? To review the project from its very beginning can help us to answer this question. 2. The artwork’s objective is like a seed, from where roots will grow. 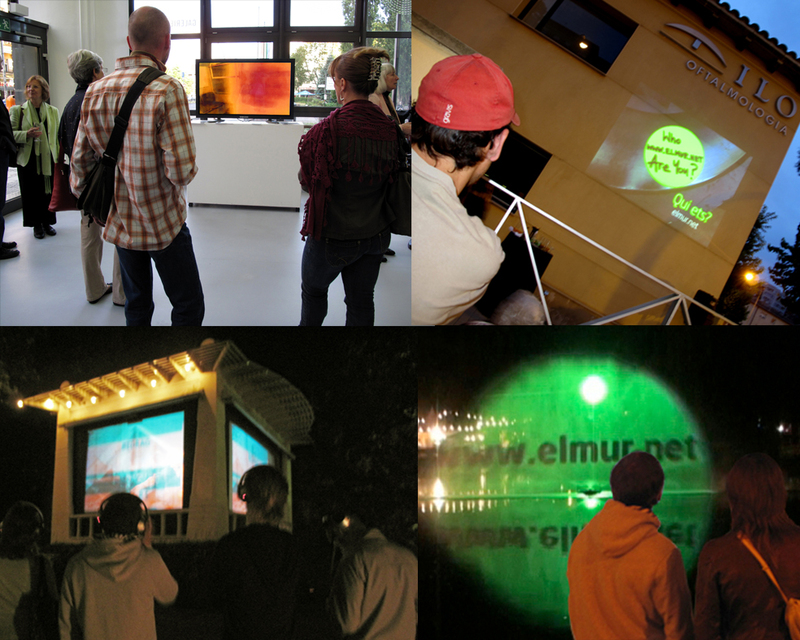 One of the main objectives of ELMUR.NET is to facilitate communication by means of audivisual language, in order to use audio-visual art as a social transformation tool and to articulate an intercultural dialogue by means of images. We do not consider ourselves (ZZZ) as “artists”, understanding this word form a conception (acceptation) in which the “artist” is someone with a special genius; but as communicators, facilitators of the communication process. What is more, we consider art as a tool, not as a means in itself. ELMUR.NET was conceived from the very beginning as an art project which objective was to facilitate dialogue and social reflection by means of audio-visual language . Because we wanted to use art as a tool to foster social transformation and articulate dialogue, if there was no communication between the presented artworks and their audiences our mission was not possible to be achieved. The will of an artwork’s creator and the objectives behind this creation, are factors that affect the mediation capacities of a specific work of art. Is for this reason that we consider that art mediation starts with the conception of the artwork in itself. Moving a step forward within this perspective we have to understand that the complete process of design and creation of the artwork will then have an effect on its mediation capabilities, therefore the whole process has to be taken in account if we are willing to maximise the “natural mediating capacities” of a particular work of art. ELMUR.NET was designed cooperation with another institution Fundation Ferreruela Sanfeliu, and from the very beginning we involved their administrators, directors, and other employees in the process of defining it. Invite people to take part in the process that are not usually there, the results can surprise even yourself. From the original artwork proposal: the screening of a collection of creative videos mastered in DVD format, which was meant to be screened in a Flat TV – screen or big monitor within an eye clinic waiting room, we moved forward to a new stage and ended up with a video installation placed in the public space. Even the name of the project ELMUR (the wall in English) came out at this stage an as a result of this interaction. As we started the technical tests to set up the video installation, people around the process started asking us “what is this thing that is placed on the wall?” The repetition of the question gave the project a “natural” name, the root of it came from the context and dynamic around the process, we do believe this factor helped to grow up identification with the project, promoting a sense of belonging that has helped us along the years in growing up support to continue the project in different ways. Consider the specific context: the where determines the how. “The mountain goes to Mahoma” Where is this building located within the city will as well be a factor of the mediating equation? Our experience says so, the ophthalmologic clinic building it is placed on the way of two key social meeting points of the city: the football stadium & the Thursday market. We could say that some of our “general public” audiences come by in a “natural way”. This is in fact an advantage of public art, audiences might find themselves in front of art proposals unwittingly. Another of the main objectives of ELMUR.NET is to approach contemporary audio-visual art practises to the general public. In Lleida going to museums, art galleries or art events it is not one of the most popular social activities. Our audiences are mainly not interested in art or understand what is (or could be) the role art in their daily lives. Screening within the waiting room of the ophthalmologic clinic, as it was initially planed, set automatically limits to our capacity to approach new audiences. Going “outside”, to the public space, was seen as a much better strategy to pursue our objective and ended up being also a factor that structured the mediation strategy and the artwork’s interaction possibilities. “Expectations do play a role”. At this point might be interesting to insist on the fact that most of our audiences do not come to visit ELMUR.NET they just find it on their way. Coming back home from work, going to the gym, going or coming form to the Sunday football match, etc. ELMUR.NET is placed in our audiences’ way to somewhere else. This has its disadvantages: not everyone will have time to take attention to the videos for example; but also this fact has its advantages: our audiences have little expectations about the artwork they are going to see. The less expectations, the less deception possibilities and therefore the better are our options to generate spontaneous impact and avoid viewer’s prejudices to arise, such as “this is art and I do not like art, therefore I am not going like it, for sure it’s going be boring”. Expectation, as predisposition, does influence the intellectual and emotional relation that the viewer builds with the given artwork. 5. The time factor and other appetizing strategies. “Observe reactions and collect feedback”. As we started ELMUR.NET public screenings we said nothing and observed reactions. We did not edit a flyer, published a text or presented even its name. It was after more than 4 months that we decided to do it and determined that best to do it was to organise a party (on the street, just in front of it) to explain what it was ELMUR.NET but more importantly to collect and comment on first reactions of audiences. Delaying the official presentation of the project allowed us to better learn how to mediate it. We invited family, friends, neighbours, educators, and all kind of different people. The more perspectives we could get, the better. And indeed no better way was to do it but enjoying a Dj session, cocktails and delicious tapas. The drinks, the food and the good mood did help to facilitate the emotional disposition to approach the artwork. Waiting before presenting the artwork gave us more time to observe but also to let audiences observe it, in this way more reactions could be captured on the presentation day. We also used the chance to invite the media, who decided to produce a video and broadcasted it on the local TV station, we had also good luck with the publication of short articles on the local newspapers talking about it. The “waiting time” gave us indeed extra margin to work out our communication strategy and get the media to talk about it. “Repetition does help”. It is not easy to measure the degree of success when talking about art mediation. On one side the aesthetical experience does occur within the minds and thoughts of our audiences, it is not easy to access and evaluate it. On the other side, audiences sometimes do not even know how to verbalise what they experience in front of a work of art or other times the means to do so are not there, even in case they do they might not be used. Observing the main feedback collected from neighbours of Lleida’s video installation has helped us to observe and better understand that repetition and the possibility to work in long time periods matters when considering art mediation processes. Along the 1st year most of the people asked themselves “what is that?”, the most common answer was: advertising, although no logos where being screened at any time. We observed that people are used to think that images on public spaces are ads, to partially solve this issue we placed a sign briefly explaining what is ELMUR.NET. We also did some experiments to provoke reactions and check if the people was indeed looking at the screen or just ignoring it. We screened a video which showed images of the streets just in front of the video installation,images on show where taken with day light (screening does always take place after sunset). At the time we did collect more than 2 complains of people who declared to be irritated by the fact of being live recorded as they where passing by, next to them we got a petition to screen the video again. Indeed some audiences were no paying attention at the fact that images where edited, showing multiple points of view, and also showing daylight scenes; others enjoyed the experiment; we where able to collect feedback with a smile. Experimenting with “provocation” can enlighten interesting clues. Along the second year people kept asking “What is that?”, answer was still mainly the same but at least doubt was starting to broke the ice, they were not sure of what was in fact being advertised. A question mark appeared after 365 days of repetition. Next to it, repeating audiences started to appear, some neighbours where passing by on purpose from time to time to discover the current creative video proposal. By then we’d opened the project to participation, built up the website platform, organised a second party on the street, distributed postcards, posters and created short textual videos which synthesized the spirit and meaning of the project. Repetition as well as long time periods can help to generate a change on audiences’ attitude in front of the artwork. More people came this time to the party, two magazines reported about it with an article and a curator form another festival who attended the event decided to include ELMUR.NET on the next festival edition. All of the sudden mediating efforts seem to multiply by themselves. Along the last 5 years we have had the chance to repeat ELMUR.NET experiment within the context of different locations, types of events, cities and countries. This has allowed us to compare reactions and learn from it to better understand it from the audience point of view. With ELMUR.NET every specific presentation is re-thinked, considering the site-specific conditions: the location and its technical limitations, its context, the type of publics, the dynamics within the event such as: will the people be seating or walking around? Might they be attracted by something else that might even be more “spectacular” near by? Do they understand English? Does the content of the video has any link to their specific cultural customs? Etc. Questioning the artwork from the audience’s perspective does help to better articulate mediation. The way you say it can make the difference. Use accessible language, more people will be able to understand you. Since then we pay more attention to written texts, communications, articles, open calls, facebook posts, etc. to make sure that we are using accessible language. Also to be able to give and circulate the more interviews, articles, etc. the better. 6. To strategically curate can facilitate art mediation. From the curating perspective we decided to take in account seasons, news on the media and public opinion emotional states when choosing which specific video was going to be screened. Playing with it, either by contrast or similitude, combining more accessible videos with more complex ones, screening complementary videos one after another, etc. demonstrated to facilitate that audiences built an emotional and intellectual connection with the presented artwork. Also if one video was more accessible than the next one, then audiences seem to keep motivation alive and not loose hope to maybe at some point be able build a connection with an artwork that they haven’t not yet understood. We noticed that if audiences had already build up this connection once, they will keep easily hope and motivation to do it again. This fact encouraged them to re-think, look for alternative meanings, re-observe what they have not yet understood. In conclusion we can say that allowing accessible artwork to balance the whole conceptual complexity of a give proposal might help to encourage audiences to persist and therefore align their approach to the artwork with our mediating efforts. From the curating perspective, on a local context, we also noticed that programming local creative proposals helped us to connect with new audiences. One their work was on show, they invited other people to pass by, and see the video. Programming locals on the big screen also helped out to break clichés such as “art is only for elite people”. Mediation understood form a holistic approach it means a particular way to understand the whole process involved; it is an attitude, a particular way to understand and interact with art. And therefore all actors and facts involved around the artwork can structure the mediated experience in a particular way and degree. Indeed art mediation is the result of a a complex equation, as we have observed almost any opportunity can be a mediating opportunity, as well as mediating tools can have many shapes and formats as we can never ever imagine. “Every detail single matters” alerted our introduction’s subtitle, only our own creativity, our ability to observe and interpret facts, sets the limits of art mediation strategies. *Dedicated to Maria and Tomas for igniting in our hearts and minds the flame of the holistic art mediation approach. This is one of the conclusions that was discussed within the Symposium of Art Mediation in Leipzig, within the frame MitOst Festival 2013. We should consider that the interpretation of what should Art Mediation practises be in itself are dependent of the interpretation of related issues such as what is considered art?, even affected by the specific definition “art mediation” as a concept. Art is a complex issue in itself, and therefore is art mediation also complex to define. Genius: 1 a person with exceptional ability, esp. of a highly original kind 2 such ability or capacity i.e. Mozart’s musical genius  Like a key that is able to open a door lock, we consider art as tool or process that in understanding it can help us to better understand the human experience of reality. Art as a shape that pretends to embrace and contain a concept, an idea, an emotion, a feeling, an action or reaction making use of aesthetic language. To communicate we need to generate a dialogue, an interaction, that might be tangible, physically executable – touchable – but also that can be generated in an intangible dimension, for example in the mind. A mental interaction is no less an interaction just because we can’t see it. Of course ta this point we could enter into philosophical discussion, but let leave that for philosophical experts, and along this paper consider this perspective of understanding as possible, without need of further proves. Along the development of this article we will better understand what does it mean when we refer to the “natural mediating capabilities”. Those capabilities that indeed arise from the work and are not placed “on top of it” after the creative process has been closed by its creator. A non-profit private institution dedicated to foster the right for health, specifically focused on eye health from a medical, educational and cultural perspective. Foundation Ferreruela Sanfeliu was born within the context of the private ophthalmologic Clinic ILO (Lleida Institute of Ophthalmology)  in fact elmur.net project was originally born as an investigation about the ability of audio-visual creative practises to generate social interactions and contribute to positive social transformation, it evolved towards a VJ session series until it was adapted again into a DVD, juts before it mutated into a permanent video installation on the public space. Later on we will develop the reasons why, as the use of accessible language it is also a mediation strategy to be considered. You can generate curiosity, attract the attention of the viewer, it will be easier to generate the motivation needed to invite audiences to face and undergo artistic experience, a kind of experience that does require active action from audiences in order to happen. Presentation day at “Catarsi” cultural magazine of Lleida TV http://www.youtube.com/watch?v=RpeJL9hEz4g  Getting direct feedback of a experience occurred in the street is not an easy issue. Although observation sessions have been undertaken and feedback was also verbally collected at the Eye Clinic reception desk among other factors such as the fact that Lleida is a small city, with about 120.000 inhabitants, one of those cities where almost everyone knows everyone, and this helped us to collect feedback. Due to the technical limitations, projections can only take place when it is dark. ELMUR.NET video installation in Lleida works from sunset until midnight every night since December 2007. 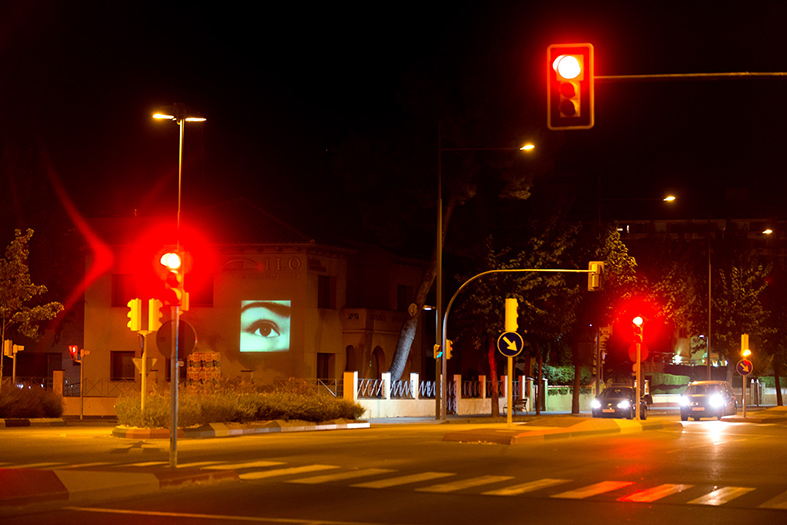 For example, Lupe Capell Gasol organised a drive in cinema with her friends to whatch her video being projected at elmur-Lleida video installation. Tags: art education, art in public space, art installation, art mediation, contemporary art, elmur, elmur.net, Lleida, public space, spain, TripleZeta, video, ZZZ. Bookmark the permalink.